These are great little tables! Finish is nice and quality is good. The tables are beautiful and easy to put together. All you need to do is screw in the legs and you are done. They are sturdy, good color and are a wonderful addition to our home. Nice quality. Love these. Look great in my small living room the color is true to the picture. I’m using them as an end table. The tables are roomy enough for several necessary items. These little nesting end table are so cute. They fit very well under one another and can easily be pulled out for a second table option. They are very sturdy as well. 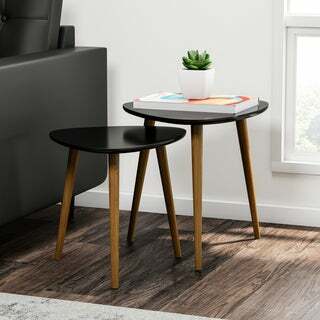 Great small tables for a modern design. Cute little nesting tables. The edges of the tables are painted a milk chocolate brown. I have painted them black which is a better contrast to the top and legs. I would have prefered a veneer edge. It would have given them an upgraded look but, they perform the function I needed.